OK, so I cheated a bit today. Taking the train from Vienna to Budapest (see luggage taking a break too), where I’m going to lay up for a while, see old friends and make a serious attempt at learning Hungarian. The Hungarians are so keen that foreigners should master their imposssible, upside-down but fascinating language, that they massively subsidise classes at the Debrecen/Budapest summer school – which has a three-week intensive course starting here in a week. Perfect timing, picking up on lots of hard but ultimately incomplete learning during my time in Vienna in the ealy 80s. In which city, warm thanks to Brigitte and Andy for their fabulous four days of hospitality while I nursed a sore ankle. 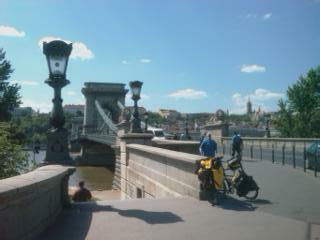 Taking a break with my passion for Hungarian (was I a Magyar in an earlier life?) will also give time for the tendon to heal before cycling on into Transsylvania, most probably, to meet up with brother Hugh and check out on Dracula and the some of the world’s most beautiful landscapes. Today, meanwhile, IT WASN”T RAINING. 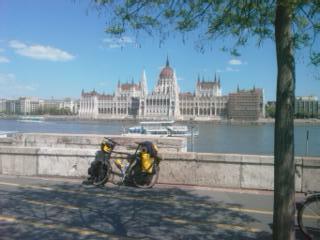 Gloriously sunny, in fact, and Budapest and the Danube – Chain Bridge and Parliament above – positively sparkled. Trees bursting into green, warm and everyone out by the river relaxing and cycling and reading and talking. Mainly Hungarian. Spring as she is meant to be. At last. So, expect something of a break in blogging for now, and then a probably sporadic resumption, as the Blackberry coverage in rural Hungary and Romania when I get moving again won’t be brililant. Still, it’ll be good to be pedalling again. In Hungarian.